If your vehicle’s transmission fails to function properly, your entire vehicle will soon fail to function properly. The transmission is key to the performance of any type of automobile. For this reason, it’s important to keep a careful eye on your transmission at all times. If it encounters any problems, they will need to be corrected as quickly as possible. Now, you may be wondering: how do you know if your transmission has encountered problems? The answer is by looking out for the following signs. Here are the common indications that you require transmission repair in Addison, Illinois. It’s simple: if burning smells are regularly making their way from your vehicle, your vehicle has encountered some sort of problem. Burning smells come about for a variety of reasons, from deteriorated drive belts, to oil leaks, to impairments with your transmission. Regardless of the reason for your burning smells, it’s of utmost importance that you have your vehicle inspected by a repair technician. He or she will be able to identify the source of the problem, and can perform any necessary repairs. Every once in a while, you should take a look at your transmission fluid to ensure that it looks the way that it’s supposed to look. Ideally, your fluid will possess a dark red tint. If your fluid instead possesses a brown or black tint, it is likely time for some new fluid. Over time, as transmission fluid is used and cycled repeatedly, it will become black, sludgy, and burnt. The more black, sludgy, and burnt it becomes, the more difficult a time it will have lubricating your transmission properly. Therefore, if your transmission fluid is discolored in this manner, it’s wise to have it flushed and replaced with fresh fluid. A transmission repair specialist can get the job done for you. When your car shifts gears, it should do so with little to no hesitation. If you feel your car “stalling” or “hesitating” as it moves from one gear to the next, it likely has a problem with its transmission. In all likelihood, it just needs a fluid change. However, in some cases, the transmission itself might be the problem. If it has suffered physical damage, it could require repair. A sure sign that your transmission needs to be repaired is if transmission fluid is leaking out of your vehicle. Transmission fluid should, under no circumstances, be leaking out of your transmission. Generally, when transmission fluid is leaking, it’s because your transmission has suffered some type of physical trauma. The best-case scenario is that your transmission can be easily repaired. The worst-case scenario is that you’ll have to have your transmission replaced entirely. An Addison transmission repair company can help make that determination for you. Cars make noises of all kinds. However, while some noises are normal, other noises are signs of damage or impairment. When a transmission has been compromised, it will typically make either a grinding or bubbling noise. Whereas a bubbling noise is usually indicative of low transmission fluid, a grinding noise is usually indicative of a damaged transmission. In any case, it’s highly recommended that you get your vehicle into an Addison transmission repair shop as quickly as possible. Do You Require Transmission Repair in Addison, Illinois? Is your car demonstrating any of the above-referenced symptoms? 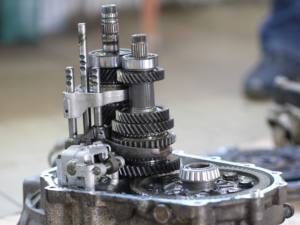 Do you require transmission repair in Addison, Illinois? If so, the auto mechanics here at King Transmission are the people to see. Our mechanics are well-versed in the diagnosis and repair of all types of transmission problems. We’ll have your car up and running in no time.